Sure hope this got your attention, stopping and thinking, and saying to yourself “That actually sounds really good”. Have you ever had this combination before? I’ll tell you I hadn’t myself. I wanted to make something that felt different, but still approachable. With Thanksgiving right around the corner, that offered inspiration, and pumpkin and apple came together in oh-such-a-great-way. The use of the apple gives the dessert great texture that you do not get with a normal cheesecake. 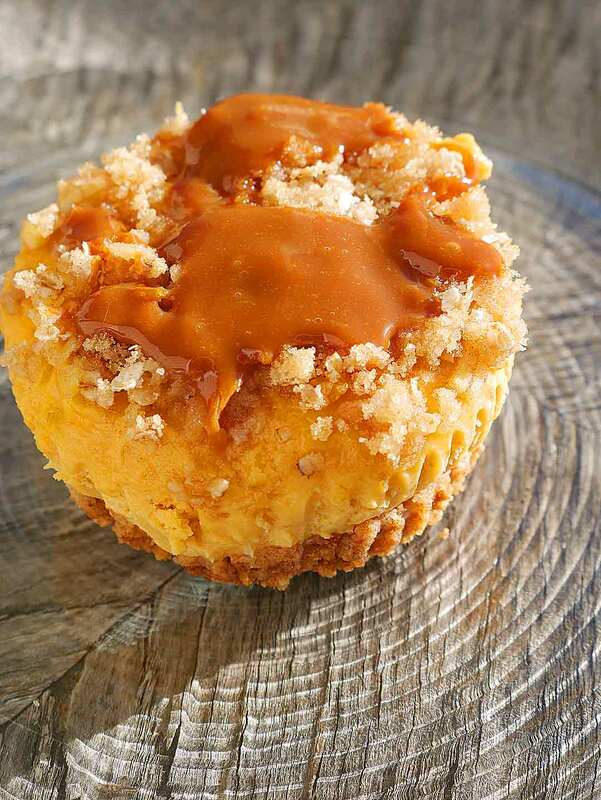 When you’re eating a pumpkin apple streusel cheesecake you’ll have that feeling that you know you’re eating something special. Plus, the dessert doesn’t have a strong taste of pumpkin, or too sweet. Such a great dessert all around. Cut in half, remove seeds and place on roasting pan at 375 for 40 to 60 minutes or until fully cooked. 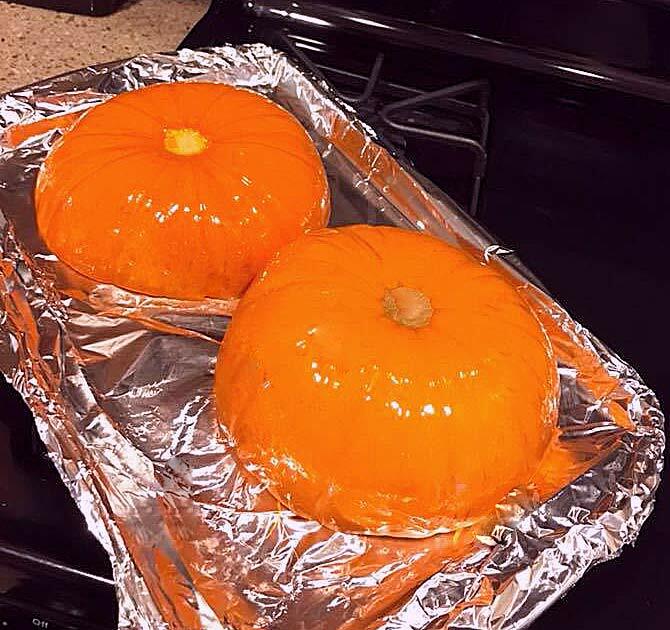 Pumpkin sizes vary a lot, so watch your cooking time. Remove roasted pumpkin and add a pinch of salt and puree or smash. Place in refrigerator to set-up and allow the flavors to develop. You can use the same day if that fits your schedule better. 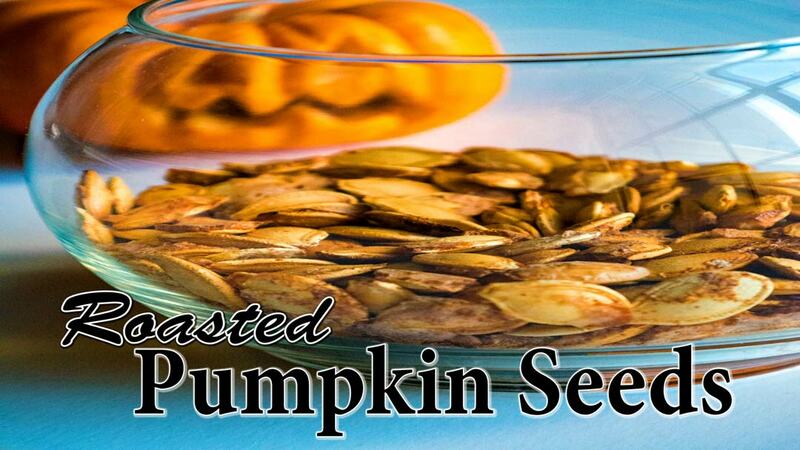 If you roast your own pumpkin be sure to keep the seeds and make the most amazing roasted pumpkin seeds. Add 2/3 cup of sugar plus one stick of butter to bowl and cream/mix together, add vanilla. Add room temperature cream cheese and combine. Then add the pumpkin, caramel (warm), plus the sea salt and mix well. Take 12 Graham Crackers and crush (Use a plastic bag to reduce mess) In a bowl, add 2 oz (half stick of butter)sliced, add 1/4 tsp of cinnamon and 2 tsp of sugar. Ingredients: 1/3 Cup of Sugar, 1/4 Cup of Brown Sugar, 1/3 Cup of Instant Oats, 1 1/2 tsp cinnamon, 1/4 tsp sea salt. Add crust to the cupcake tins filled with cupcake papers. Press the crumb crust down to shape the bottom of the cheesecakes. Add cheesecake filling and pat the tops down. Add the sliced apples to the top of each cheesecake (Slice quarter of an apple lengthwise into stripes) Use as much or as little as you like. Just be sure to add enough for texture. 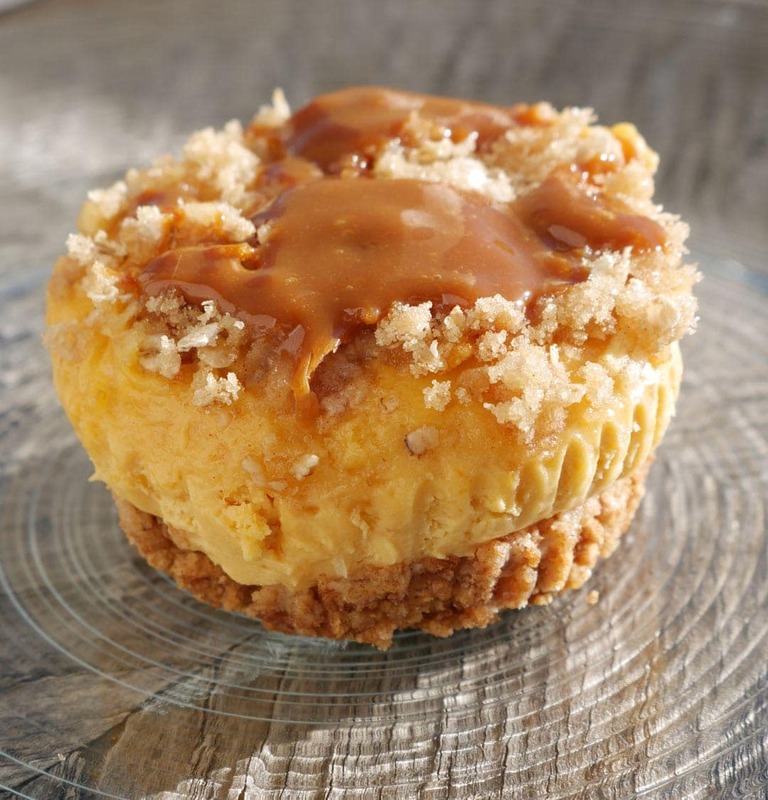 Add streusel to the tops of every little cheesecake. Add enough to cover.